We have attempted to domesticate certain animals and failed. This happens for several reasons. Most of the time, it is because some animals are so wary of humans that the creatures will flee at first sight. Others are just too aggressive to be domesticated, which may lead to attacks on and even the death of the breeder. Another distinct category of animals is classified as tamed but not domesticated. In these cases, the animal has been bred to tolerate and maybe obey humans, but it is not safe enough to be classified as a domestic animal. Tamed animals still have their wild instincts and can quickly turn rogue. Colonists encountered transportation problems as they moved deeper into Africa in the 19th and 20th centuries. Their horses were susceptible to different diseases, and bringing new horses from Europe was not always that easy. To solve this problem, they turned to the zebra, a close relative of horses and donkeys that is plentiful in the African plains. Zebras are also immune to several diseases that affected horses. However, all attempts to domesticate the zebra failed. The zebra is a very alert and aggressive animal. It is naturally suspicious of other animals, including humans, and will flee at the slightest hint of danger. It is a fast runner, making it extremely difficult to capture. If caught, it will deliver heavy kicks and bites in an attempt to escape. Although the colonists managed to get some zebras, they quickly realized that these animals are smaller than horses and uncomfortable to ride. Besides, zebras do not like to be ridden and will become aggressive after a while—even after they have been tamed. The aggressive nature of the zebra has been traced to its evolution. It shares its habitat with predators like lions, crocodiles, hyenas, leopards, and man. This was a major issue with the colonists, who feared that these predators would be attracted to their domesticated zebras. A series of attempts to tame or domesticate the great white shark have failed because captured great whites will usually die within days. The first great white held in captivity died within hours. The longest this animal has been held in captivity is 16 days. Captured great white sharks are also fond of hitting their heads on the aquarium’s glass walls. One shark held at Okinawa Churaumi Aquarium in Japan continued bashing its head on the glass wall until it died. Another one held at California’s Monterey Bay Aquarium hit her head on the wall continuously and attacked two other sharks until she was freed. Great white sharks don’t fare well in captivity for several reasons. First, they are great travelers, capable of moving through an entire ocean. They also need lots of water to breathe. So, even large aquariums are too small for them. Captured sharks are also unbelievably aggressive and will usually refuse to eat. When they do, they require live prey, which is difficult for the aquariums to provide. Dingoes are doglike animals that live in Australia. Despite their similarities to dogs, they are not considered dogs and are not domesticated. Australian farmers even consider them as pests. Interestingly, it seems like we partly domesticated the dingo thousands of years ago before allowing them to return to the wild. There is a little difference in the way we domesticated dogs and dingoes. Although dogs are considered companions, early native Australians—who probably domesticated the dingoes—considered them a source of food. Besides, native Australians did not selectively breed the animals for their favorable characteristics. A few centuries ago when horse cavalries were still a thing, King Karl XI of Sweden decided that he wanted a more ferocious animal to replace his horses. An animal that would send the horses of the enemies fleeing the battlefield at first sight. He settled on the moose. Unfortunately for the king, the plan never worked out. As he later found out, the moose was too dangerous to approach. This worsened during mating season when it got uncontrollably aggressive. Besides, the moose is susceptible to disease and has a varied diet that is difficult to provide. Moose are also smart creatures and will usually avoid the war front. When they did go near the battlefield, they fled the moment another moose was killed. Other attempts to use them as meat were unsuccessful. They would refuse to go to the slaughterhouse when they realized that the moose taken there earlier did not return. Despite these challenges, there is an ongoing moose domestication project at Kostroma elk farm in Kostroma, Russia. The project started in the 1930s when Joseph Stalin decided to set up a moose cavalry. Like King Karl XI’s plan, Stalin’s project failed. But Nikita Khrushchev revived it when he attempted to domesticate moose for meat. This also failed, and several moose farms shut down. However, the Kostroma elk farm remained functional and is still trying to domesticate the moose. Primarily, the facility is used for the production of moose’s milk now. Raccoons are a good candidate for domestication. They are skilled climbers and can enter tight spaces, making them an excellent working animal. If domesticated, they would be useful for senior citizens and the physically challenged. However, they cannot be used as working animals because they have not been domesticated. Despite their cute looks, raccoons are aggressive and destructive. They are naturally curious, like moving around, and quickly become destructive when confined to an area. They usually need to be constantly monitored and bite when hungry or angry. Bites can turn fatal because they can infect humans with rabies. As raccoons can use their hands like humans, they will usually attempt to open anything they lay their hands on. They are also experts at escaping. In fact, this is a major reason why domestication attempts have failed. Besides, they like being alone, are not social animals, and are not loyal to humans. We once fully domesticated foxes. However, they died off and modern attempts to domesticate them again have been partly successful. In a bit of irony, the extinct fox we domesticated was called the Fuegian or Yaghan dog. It was domesticated from wild populations of the culpeo (aka the Andean fox). Curiously, the Fuegian dog was not really popular during its time. This was probably because it was not as useful as a regular dog. There is also evidence that we tried to domesticate foxes long before the Fuegian dog, but we dumped them for cats. Cats were selected over foxes because we could not determine what to use the foxes for. Foxes are difficult to domesticate because of their unbelievable stubbornness. Russian geneticist Dmitry K. Belyaev sought to change this in the 1950s when he started a project to domesticate the silver-black foxes. Silver-black foxes are actually red foxes affected with melanism, which is the opposite of albinism and makes affected animals appear black. Four generations later, the foxes were displaying doglike behaviors. They developed a fondness for people, wagged their tails, and licked their breeders. Fifty generations later, they are barking, respond to humans, and understand gestures. They also make noises that are distinct from wild foxes. The project is ongoing and is considered successful. However, the foxes are tamed but not domesticated. Asian elephants are not considered domestic animals even though they have been captured and trained for over 3,000 years. Rather, they are classified as tamed or wild animals. Captured and trained Asian elephants are not considered domestic animals because they are not selectively bred. “Selective breeding” means that humans will select the offspring to breed based on certain favorable traits. To be domesticated, they would need to be selectively bred for up to 12 generations. By the 12th generation, they should be genetically distinct from their wild ancestors and would be considered domestic. In general, captured Asian elephants are not selectively bred. (Only a few were selectively bred past the second generation.) This makes them wild animals. They only allow humans to ride them because they have been trained. Nevertheless, they are just like any wild animal, which makes them unpredictable. Bonobos are unique on this list because they are not wild animals. They are domestic animals even though they were not domesticated by humans. Bonobos domesticated themselves. Scientists are not sure how this happened. But they think it began to occur about two million years ago when the Congo River formed in Africa. This event separated the ancestors of the bonobos and the chimpanzees that lived there. The primates to the north of the river evolved to become bigger and more aggressive because they competed with the bigger gorillas for food. On the other side of the river were the primates that would become the bonobos. They had more than enough food to eat, and there were no gorillas, either. Their females became picky and decided which males they wanted to mate with. Aggressive males died out because the females preferred gentler males. Humans have wisely stayed away from the hippopotamus, one of the world’s deadliest animals. More people are killed by hippos every year than lions, elephants, leopards, buffalo, and rhinoceroses combined. Obviously, any meeting between a human and a hippo will most likely end up badly for the human. 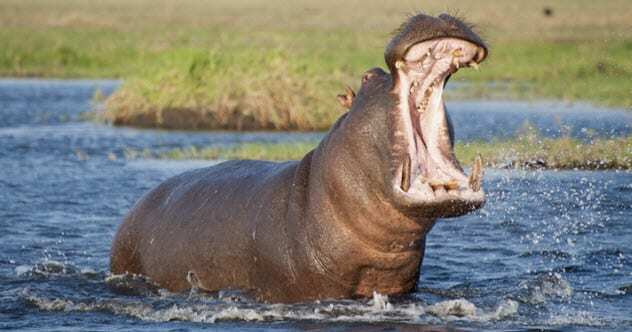 Hippopotamuses have large teeth and are unbelievably fast. Hippos can run up to 48 kilometers per hour (30 mph) despite their massive weight. Usain Bolt, the world’s fastest man, barely reaches 45 kilometers per hour (28 mph). Nevertheless, there have been independent attempts to domesticate the hippo. As expected, those efforts ended badly. In 2011, Marius Els, a South African farmer and army officer, was killed by a 1.2-ton, five-year-old hippo he was trying to domesticate. Els called the hippo Humphrey and considered it a pet. He often took Humphrey swimming and once rode on it, saying that the animal was “like a son” to him. Humphrey did not consider Els as a father because it killed him in the same river in which they used to swim. Before killing Els, Humphrey was already a known local terror in the area in which they lived. The hippo once chased a man and his grandson up a tree after they canoed on the river that ran through Els’s farm. Humphrey was also infamous for killing calves and chasing golfers at a nearby golf course. All attempts to domesticate the coyote have failed because they naturally avoid humans. Human breeders are also wary of these animals because they can be infected with dangerous diseases like rabies and tularemia. However, some breeders have braved these risks and tried to domesticate the coyote. One common method is to crossbreed a male coyote with a female dog. While the resultant hybrid is less aggressive toward humans, it is not a true coyote. Another method is to take young wild coyotes from their mothers and train them into adulthood. Wild coyotes become less wary of humans after about three generations, but they are not domestic animals. In fact, several attempts to domesticate a coyote have ended with the coyote attacking the breeder. This happens because a coyote close to humans could begin to consider a human as prey and will look for the best time to attack. Interestingly, coyotes are slowly becoming domesticated. This is happening naturally, the same way it probably did with bonobos.